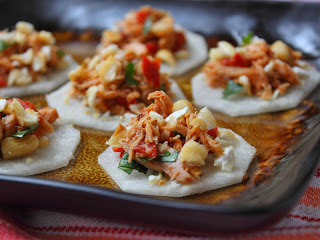 Food Wishes Video Recipes: Heading to South Beach to be a Tonnino Tuna Ambassador! Heading to South Beach to be a Tonnino Tuna Ambassador! Well, that's one blog title I couldn't have anticipated writing, but that's exactly what's happening tonight as I board a red-eye for Miami. As many of you know, I won the Tonnino Tuna Chef Challenge recipe video contest, and one of the prizes was getting to serve as their Chef Ambassador for the year. As part of my duties, I'll be representing them at the 10th Annual South Beach Wine & Food Festival. Pictured here is an "Upside-Down" Tonnino Jalapeño Tuna Taco Bite that I created to celebrate the event. Recipe cards will be available at the Tonnino booth at the Grand Tasting, but I've posted the written recipe below, just in case you're looking for a cool app for your upcoming Oscars party. Enjoy! Note: I've finished the sweet and sour pork video, and will be posting that tomorrow, so stay tuned! Also, be sure to follow along with me on Twitter for my bite-by-bite coverage of the #sobewff, as we refer to it in the tweets. Using a sharp knife, trim the peeled jicama into a cylindrical shape, about 2-inches in diameter. Using a vegetable slicer, or knife, slice the jicama into about 24 "chips" (about 1/8-inch thick). Drain the tuna (saving the oil for a salad dressing), and add to a small mixing bowl. Pick out the pieces of jalapeño that came with the tuna, and dice fine. Add back to the bowl. Add the red pepper, cilantro, and chipotle. Mix with a fork until combined. Divide the tuna mixture onto the jicama chips, and top with the crushed corn nuts. It looks delicious, I like your food photography.